So few people notice Sam Kennison that he may as well live life in outer space. Not that it really matters since he feels comfortable in his "nerd" skin. It helps that he has loyal friends, even if their position on the social ladder hovers near the lowest rung. It also helps to have hobbies like horror movies to watch and screenplays to write. When the new English transfer, Camilla Carter, starts at Bowen Lakes Secondary, Sam barely notices until she starts to work her way into his group. He seems genuinely confused as to why she would want to hang out with him and his friends when other cool kids are jockeying to include her. He tries to ignore her, but she uses their common interests of World of Warcraft and Star Wars to build a friendship. Sam's quirky humor shines its best through his inner monologues, especially in trying to deal with the breakdown of his parent's marriage. 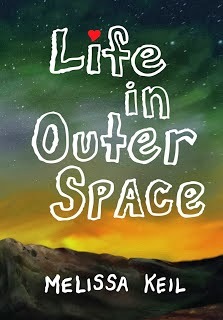 Though the secondary story line about his best friend fizzles, the surprising budding relationship between Sam and Camille make Life in Outer Space a must read young adult novel. A romance with a rare strong male protagonist that is sure to cross gender lines. Though Camilla seems to good to be true at first, her own struggles make her a character worth rooting for. In the end, its hard not to fall in love with Sam and his own minions. Use the Rafflecopter form to enter. By entering, you acknowledge you have read the terms on the form and agree to them. Contest ends 10/29/2013 at 11:59 p.m. EST. Prize fulfillment is by the publisher. Blog owner is not responsible for prize fulfillment. I think my son would like this because he feels like he is a nerd as well. I think it'll be interesting for kids as it is space themed. This sounds like something my kids will want to read. I think my kids could relate to Sam,he sounds adorable. My son likes Warcraft and Star Wars and reading. My nephew loves everything about space. I want to win this for a child who loves space. My grandkids would love the space theme! I think my 13 year old son could relate to this book - he has "nerdy" interests (that I encourage - although his game of choice is Minecraft), but doesn't care much about his social standing... and is also really starting to notice girls!